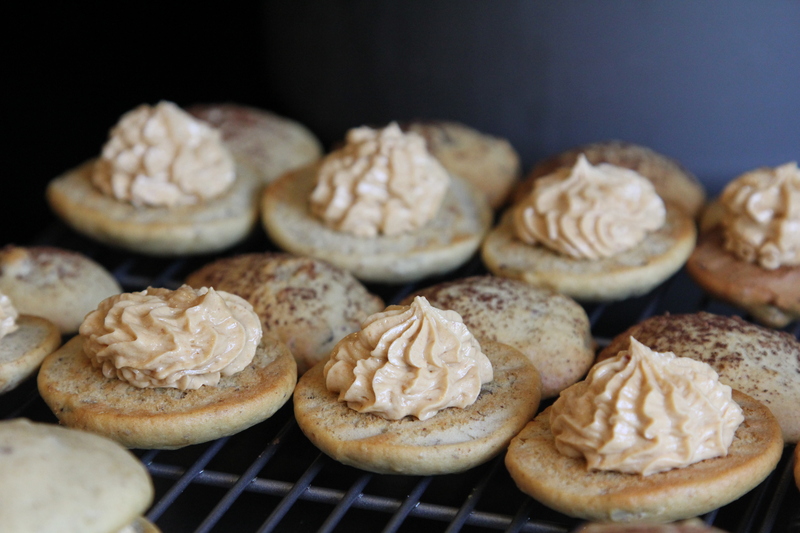 Whoopie for Whoopie Pies [recipe] – Cin Cin, Let's Eat! A couple weeks ago, my friend Carol celebrated her birthday with 25 of her friends at a wonderful Italian restaurant (Ristorante Bella Vita). 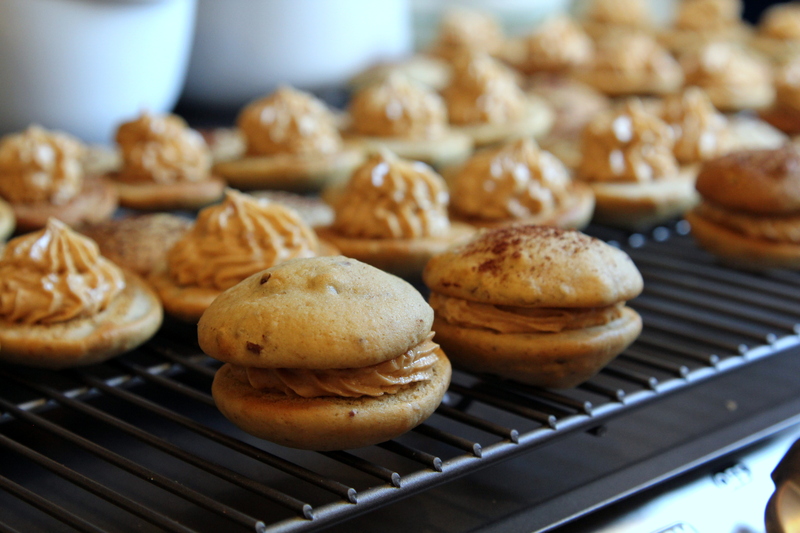 She had the cutest idea for party favors to thank her friends for coming – mini whoopie pies. The two of us had a little baking party making these adorable half cookie half cake treats. We used recipes from this book, and made two different pies and fillings. 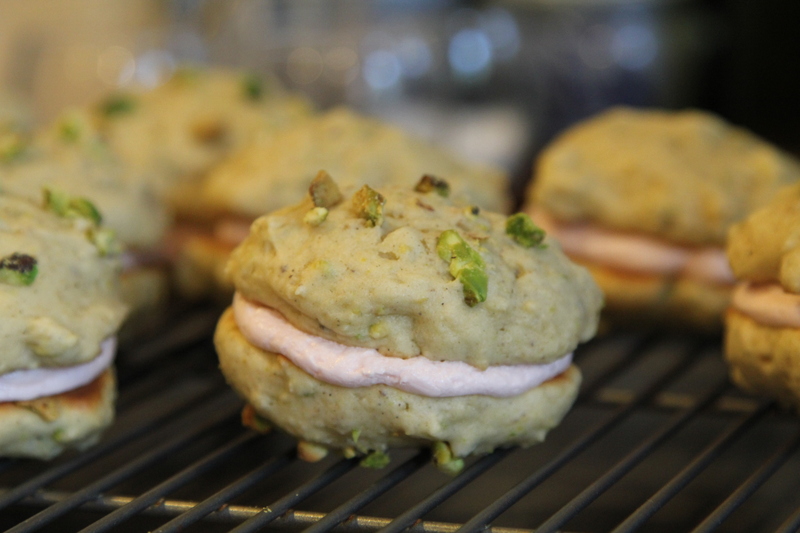 Pistachio-Cardamom Whoopie / Makes about 30 four-inch cakes. Position a rack in the center of the oven and preheat the oven to 350 degrees F. Line two baking sheets with parchment paper. Sift together the flour, baking powder, cardamom, and salt onto a sheet of waxed paper. In the work bowl of a stand mixer fitted with the paddle attachment, beat together the butter and both sugars on low speed until just combined. Increase the speed to medium and beat until fluffy and smooth, about 5 minutes. Add the egg, beating well. Add the vanilla. Add half of the flour mixture and half of the buttermilk to the batter and beat on low until just incorporated. Scrape down the sides of the bowl. Add the remaining flour mixture and ½ cup butter milk and beat until completely combined. Add the pistachios and mix just until combined. Using a small ice-cream scoop or 2-tablespoon scoop, drop about 2 tablespoons of batter onto one of the prepared baking sheets and repeat, spacing them at least 2 inches apart. Bake one sheet at a time for about 10 minutes each, or until the cakes begin to brown. Let the cakes cool on the sheet for at least 5 minutes before transferring them to a rack to cool completely. **** This recipe is a template for your nut-and-spice whoopie. You can substitute ground hazelnuts, almonds, or macadamia nuts for the pistachios and cinnamon, ginger, or other ground spices for the cardamom. Notes: Our batter turned out pretty thick, I had to add a bit more buttermilk to thin it out. We also did not make the large 4″ cakes, we used 1 tbsp of batter, which yields 2″ cakes, and we were able to get 40+ cakes, resulting 20+ whoopie pies. 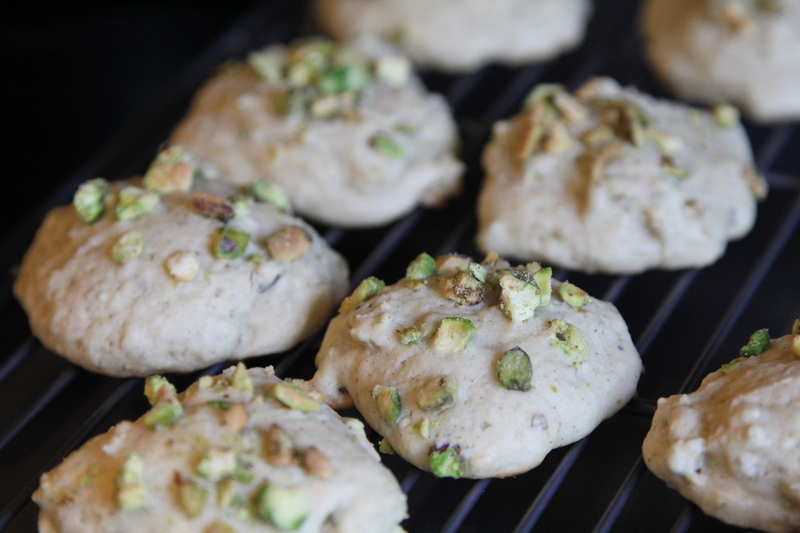 We also sprinkled some chopped pistachios on the top of the batter right before baking. In the work bowl of a stand mixer fitted with the paddle attachment, beat together the confectioners’ sugar and the butter, starting on low and increasing to medium speed, until the mixture is crumbly, about 1 minute. Add the heavy cream, rosewater, vanilla, salt, and red food coloring and beat on high until smooth, about 3 minutes. Notes: Be careful when adding the rosewater essence, it’s SUPER STRONG. Don’t over add! You can get it at Persian markets. The birthday girl was also surprised to see it available at Target. Sift together both flours, baking soda, and salt onto a sheet of waxed paper. In the work bowl of a stand mixer fitted with the paddle attachment, beat together the butter, shortening, sugar, and vanilla until light and creamy, about 3 minutes. Add the eggs and beat until combined. Add half of the flour mixture, beating on medium speed, just combined. Scrape down the sides of the bowl. Add the remaining half of the flour mixture and beat until thoroughly combined. Add the bananas and the pecans (if using) and beat on medium for about 2 minutes, until completely combined. Using a spoon, drop about 1 tablespoon of batter onto one of the prepared baking sheets and repeat, spacing them out at least 2 inches apart. Bake one sheet at a time for about 10 minutes each, or until the cakes begin to brown. Remove from the oven and let the cakes cool on the sheet for at least 5 minutes before transferring them to a rack to cool completely. **** This is a great recipe to add a tablespoon or two of flax meal or wheat germ to amp up the whole grain factor. Go ahead and eat two—it’s healthy! Notes: We dusted these cakes with a light coating of cocoa powder right before baking. They looked pretty but didn’t add much to the taste. In the work bowl of a stand mixer fitted with the paddle attachment, beat together the peanut butter and butter on low speed until smooth and creamy. Add the confectioners’ sugar and the salt and beat on low to incorporate. Increase the speed to medium and beat until the filling is light and fluffy, about 4 minutes. Note: Yes, it’s salty, but it doesn’t have to be. If you leave out the salt, you still end up with a not-too-sweet, respectably nutty filling. Neither of us have made whoopie pies before so we were not sure what consistency to look for. A lot of trial and error and adjustments. For example, we used a tablespoon to scoop the first batch (Pistachio), and used a piping bag to pipe the batter of the second batch (banana). One was more “rustic” and homemade looking while the piped batch had a much more professional appearance. We also used a bigger star tip to pipe the peanut butter filling, much more playful looking. If the filling becomes too melty, put it in the fridge for it to cool and harden slightly Always serve the pies in room temperature. We wrapped these up individually by placing one sandwich in a colorful cupcake liner, put the whole thing in a clear cellophane goodie bag, tied with ribbons and a name tag, transported them in a clothe-lined basket. Such adorable party favors! Love the combo of cardamom and pistachio. These look great. Loved making these together – I just used ’em as an excuse to hang out with you. 😉 Too bad I forgot to take a photo of the final product in the basket. Cheers to more baking parties!